When a pollution index hit a record level last month in Hong Kong, there were plenty of culprits to blame. Fingers were pointed, in descending order, at a sandstorm sweeping in from mainland China; at the factory-studded Chinese province of Guangdong just across the border; and at Hong Kong’s home-grown fumes, mainly from vehicles and power stations. Remarkably little mention was made of emissions from shipping. Which is strange. After all, Hong Kong sits alongside one of the world’s busiest shipping lanes. And the fuel being burned by the scores of freighters heading to and from Hong Kong and the nearby Pearl River Delta every day is nasty stuff indeed. Bunker fuel is a viscous and highly polluting substance left over from refining oil. It has high nitrogen oxide contents and contains as much as 4.5 percent sulfur, making the exhausts especially noxious for those who inhale them. True, in terms of carbon dioxide — which is at the center of public attention these days — ships are a comparatively efficient mode of commercial transport, with far fewer emissions per ton of goods per kilometer than heavy trucks or aircraft. But with shipping volumes up about 50 percent in the past 20 years, and now accounting for about 90 percent of global trade, that is a lot of CO2 emissions: 3 percent of the global total, comparable to the level of a major national economy, according to the International Chamber of Shipping. Perhaps even more worrying, though, is the other nasty stuff contained in bunker fuel, like nitrogen, sulfur and particulate matter — tiny particles that can penetrate deep into the lung when inhaled. Academic studies have estimated that 15 percent of global nitrogen oxides and between 5 and 8 percent of global sulfur oxide emissions are attributable to oceangoing ships. Health experts have long linked such pollution to respiratory illnesses, cardiopulmonary disorders and lung cancers, particularly among people who live near heavy ship traffic. Given that about 70 percent of ship emissions occur within 400 kilometers, or about 250 miles, of land, it is no surprise that calls to reduce marine pollution have intensified. Some parts of the world, like the Baltic Sea and the North Sea, including the English Channel, have for several years had so-called “emission control areas” in force, within which ships effectively have to switch to much cleaner fuel. Only last month, the International Maritime Organization, which is charged with maintaining a framework for shipping and whose mandate includes environmental concerns, completed plans to apply a similar policy in a 230-mile buffer zone along the U.S. and Canadian coastlines by 2012, which the U.S. Environmental Protection Agency says would save as many as 8,300 lives a year by 2020. But such policies are unlikely to take effect in Hong Kong, the Pearl River Delta or indeed the other busy shipping lanes of Asia for quite some time. Pearl River Delta ports, including the Kwai Chung container terminal in Hong Kong, which is one of the busiest port facilities in the world, handle about 12 percent of global container traffic, according to Mike Kilburn, environmental program manager at Civic Exchange, a public policy research institute in Hong Kong. 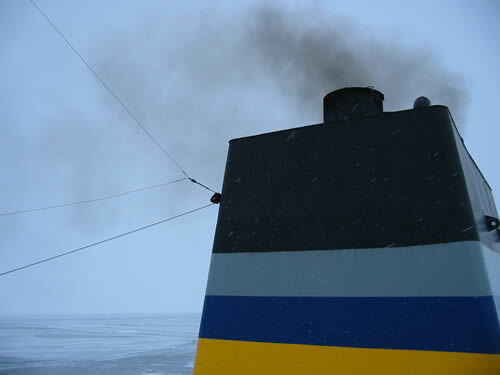 The problem — from the point of view of those who breathe it — is that bunker fuel is cheap, giving shippers a huge incentive to use it: Cleaner fuel can cost twice as much, depending on the quality. Moreover, the price of oil has risen again as the global economy has begun to recover, sending up fuel bills, which make up about 20 or 30 percent of shipping companies’ operating costs. And the shipping business is not only fiercely competitive, it is also still reeling in the aftermath of the global economic crisis. Shipping rates and volumes have improved as global trade has picked up, but they remain below precrisis levels. For routes between Asia and the United States, they remain close to historic lows. And about 9 percent of the global shipping fleet still remains idle, much more than during previous downturns, said Azura Shahrim, shipping analyst at HSBC in Hong Kong. Despite that inauspicious economic backdrop, the shipping industry says it is broadly in favor of using cleaner fuel. But shipping industry groups argue that before a switch to cleaner fuel can occur, there has to be a cross-border regulatory framework that forces all players to comply with the same requirements. And regulation of that kind is extremely tricky to draw up. It is not merely a matter, for instance, of the Hong Kong authorities’ unilaterally dictating the use of cleaner fuel. An “emission control area” of the kind that will soon take effect off North America’s coast, for example, has to be approved by the International Maritime Organization, the body that looks after international legislation on global shipping. And countries applying to have such low-emissions areas off their coasts have to show that their shore-based industries, too, are reducing their emissions — all highly laborious stuff involving regulation and much monitoring of shore-based industry emissions, explained Arthur Bowring, managing director of the Hong Kong Shipowners Association, one of the largest associations of its kind. Another option, Mr. Bowring said, would be for China unilaterally to declare the Pearl River Delta a low-emissions zone within the narrower limits of its own territorial waters. That would avoid the lengthy approval processes that a wider international low-emissions zone would entail. A potential drawback of that option is that shippers could then find it financially more attractive to go through Shanghai or other Chinese coastal ports — meaning the authorities there would, in turn, have to be included in the deliberations. There is, however, a silver lining: The issue of marine emissions will gain greater prominence in Hong Kong as emissions from other sources, like power stations, are brought under control, said Mr. Kilburn of Civic Exchange. And the Hong Kong and Guangdong authorities have at least recognized the need to make the Pearl River Delta more environmentally friendly. “That gives us some grounds for optimism, at least,” Mr. Kilburn said.